The eyes of all living beings need to be clean, that includes your dog. Here are certain tips designed to help pet parents clean the eyes of their furry babies. Certain dog breeds accumulate more dirt in their eyes than others. If your dog is long muzzled, then his eyes may gather less dirt. If he is short muzzled and has Brachycephalic features, there is high chance that his eyes will gather more dirt. The reason is that Brachycephalic dogs have protruding eyes which aren’t adequately protected because of their face shape. 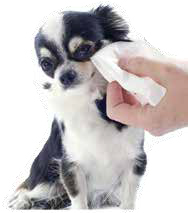 Dogs with light-coloured fur, which tends to get tear streaked and those breeds whose tear glands produce excessive tears, may also need more regular cleaning of the eyes. There are ways with which you can prevent your dog from gathering excessive soot in his eyes. Keep your dog away from you when you’re dusting and sweeping the floor, as grime may blow into his eyes. Keep him away from household chemicals. Dissuade him from travelling in a car with his head out of the window; besides being dangerous, the dust in the air may infiltrate into his eyes. Trim the fur around his eyes, if it regularly gets into his eyes. Set aside clean face cloths to clean the eyes of your dog. They need to be washed regularly, so that they don’t harbour germs. Don’t clean your dog’s ears with cotton buds or cotton wool. This is because cotton shreds may dislocate and enter the dog’s eyes, thereby creating ocular problems. Avoid using paper napkins. The napkin can be torn and paper shreds can enter the dog’s eyes. You also need to be aware of pre-moistened wipes, because these wipes may have ingredients which may harm the dog’s eyes, especially if they are wipes designed for human use. Don’t use soap or shampoo to clean your dog’s eyes. Over the counter eye cleaners are available. So, it’s better to gain your vet’s approval before using them. Never use an eye cleanser meant for humans to clean your dog’s eyes. This is because it may have a higher concentration than those meant for dogs and likely to irritate the dog’s eyes. If you cannot restrain the dog on your own, you may need a helper. Hold your dog’s head and gently pull back his eyelids. You may need to snip the shaggy fur around the dog’s eyes, if it covers them. Ensure that you do not injure the dog’s eyes while doing so. Use a blunt scissors to snip off the long fur. If you are not confident of your ability to cut the dog’s fur without injuring him, refer a vet or an experienced pet groomer to do the same. If you are using an eye cleaner, put in the number of drops in his eye, which your vet has permitted you. Gently massage the area around the eyes. Then take a clean cloth and wipe the dirty debris from around the eyes. An inexperienced pet parent may move back the waste into the eyes, instead of removing them. Gently wipe out the muck from around the eyes and from the edges, using a clean cloth or tissue. Never clean the insides of the eyes. 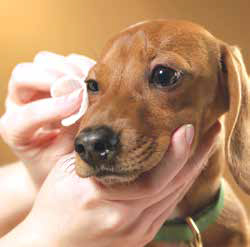 You may also use eye wipes for dogs available at veterinary stores. Reward your dog with a treat before and after the cleaning. This will motivate him to look forward to these sessions and hopefully cooperate with you. If you however notice redness, inflammation, discharge or cloudiness in your dog’s eyes, then don’t clean it. Instead take him promptly to a vet. 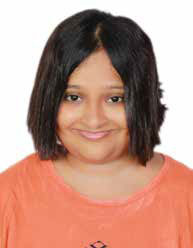 Medicines may be needed to treat the eye infection. Do not use homemade eye washes you normally found via Google searches to clean your dog’s eyes.